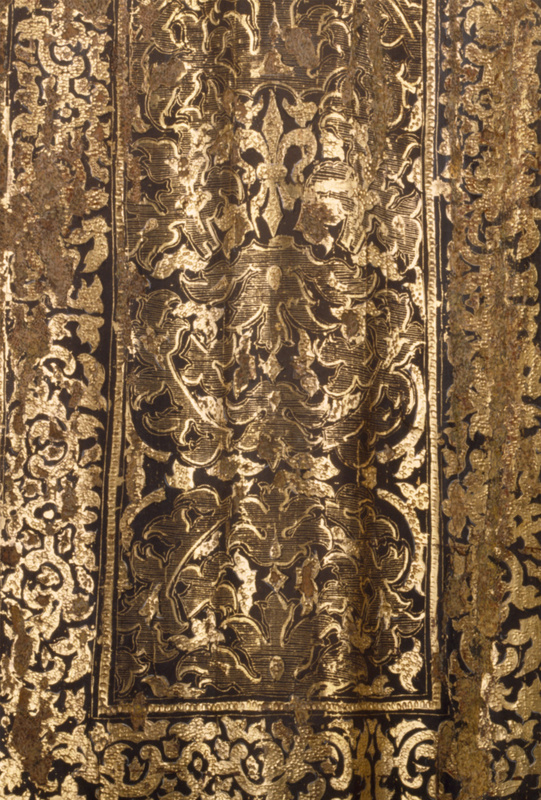 Front drape, post-conservation 94 PHTG. 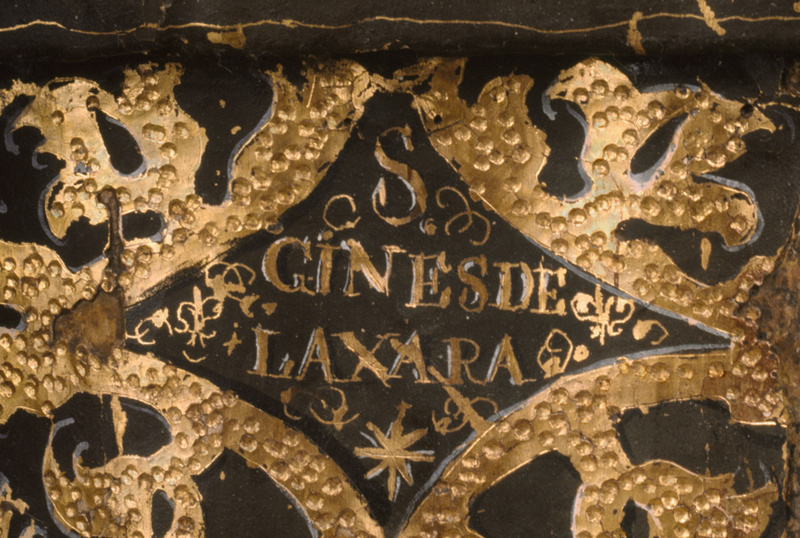 Inscription: Inscribed, "S. GINES DE LAXARA". In a richly brocaded robe, with rosy cheeks, shining eyes, and outstretched arms, Saint Ginés de la Jara appeals to the faithful standing before him. 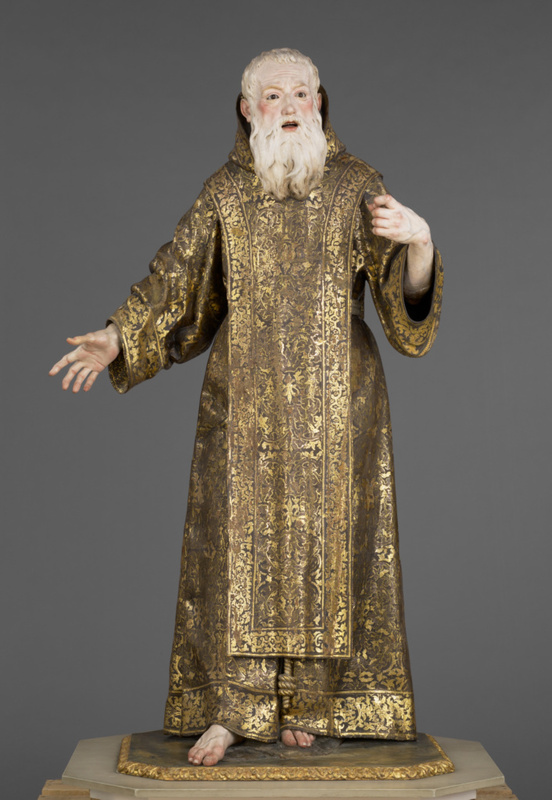 His gestures and open mouth suggest that he is preaching. According to legend, after Saint Ginés was decapitated in southern France, he picked up his head and tossed it into the Rhône River. Carried by the sea to the coast of southeastern Spain, it was retrieved and conserved as a relic. 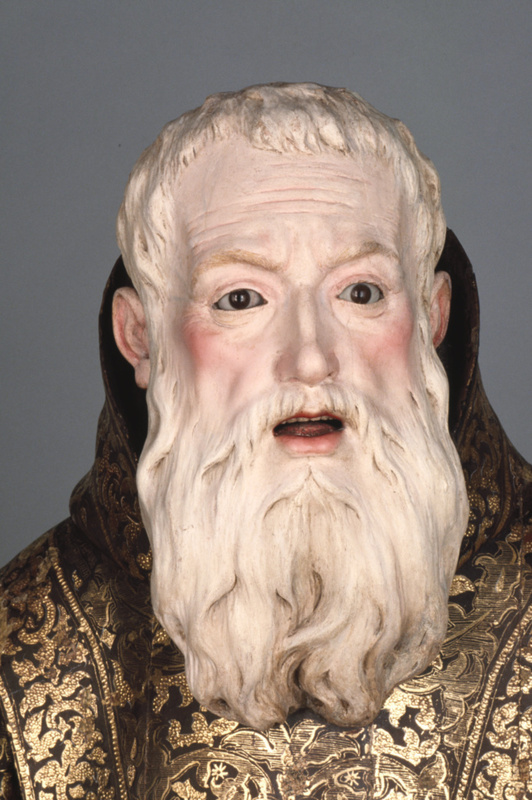 Life-sized, devotional cult objects often included glass eyes and were often made out of wood that could be painted in order to achieve lifelike results. Reinforcing the emotional experience of the faithful, such heightened realism typified Spanish Baroque art at a time when the Catholic Church sought to make Christianity more accessible to believers. Luisa Roldán, also called La Roldana, carved the work. 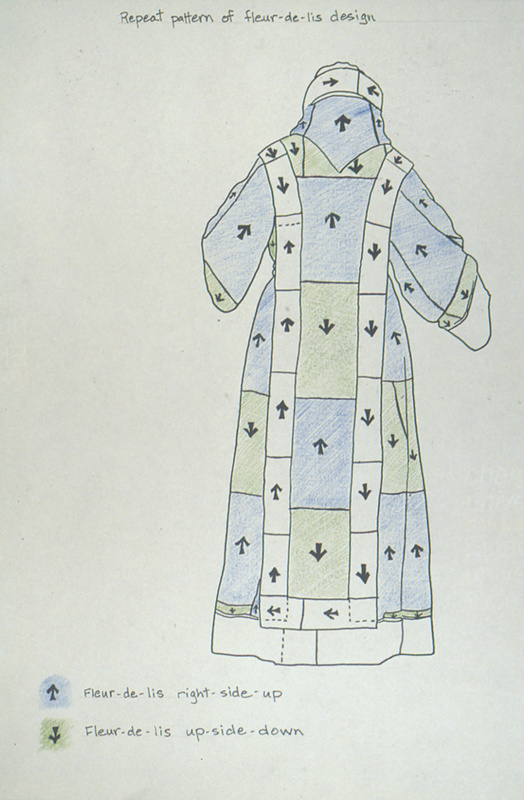 The figure was polychromed by her brother-in-law, Tomás de los Arcos, who used the Spanish technique of estofado to replicate the brocaded ecclesiastical garments. 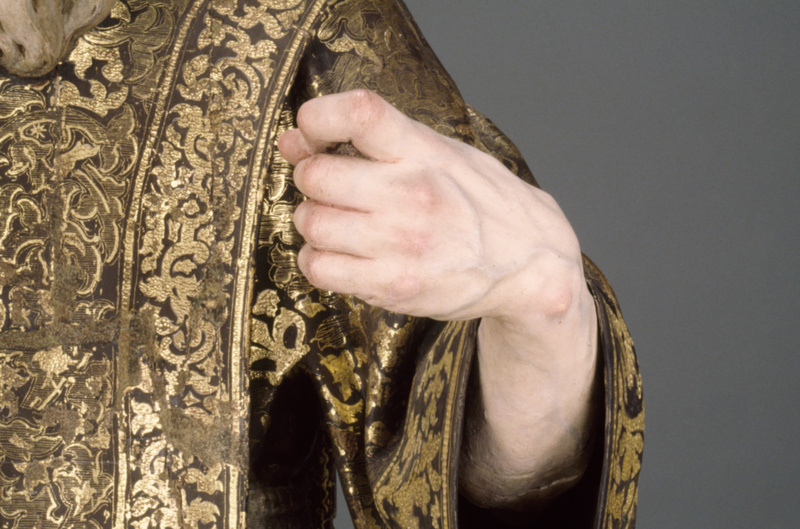 In this process, the area of the figure's garment was first covered in gold leaf and painted over with brown paint, and then incised with a stylus to reveal the gold underneath. "Acquisitions/1985." The J. Paul Getty Museum Journal 14 (1986), p. 264, no. 255. Westmoreland, R., and T.-A. Hermanès. 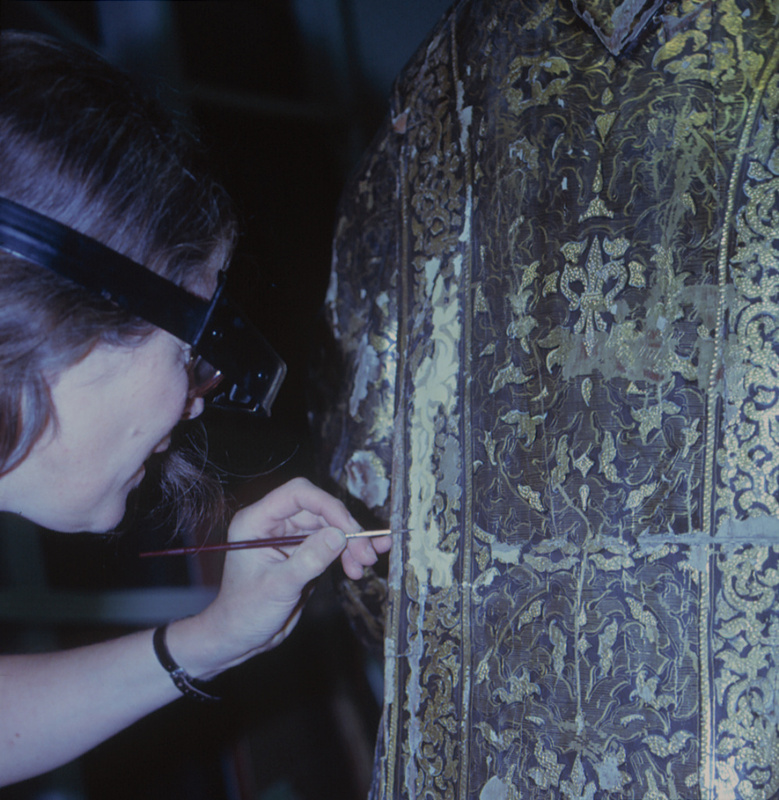 "Examination and Treatment of a Seventeenth Century Spanish Polychrome Sculpture by José Caro." 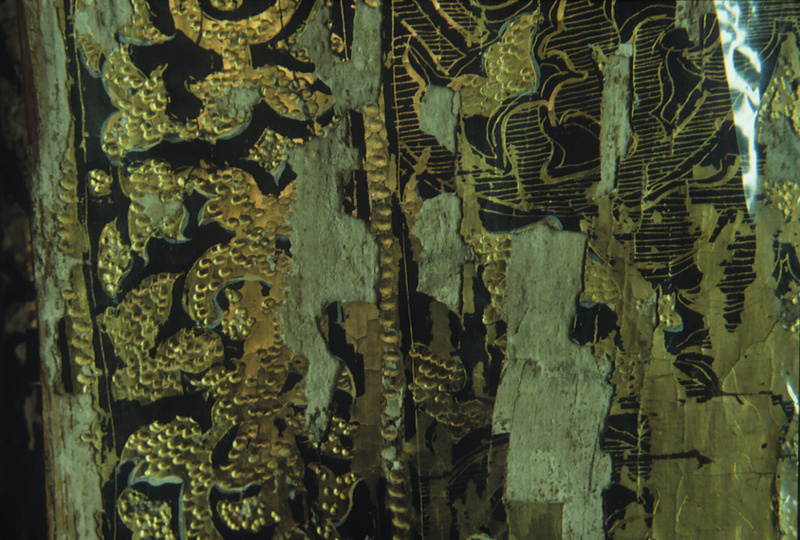 Conservation of the Iberian and LatinAmerican Cultural Heritage: Preprints of the Contributions to the IIC Madrid Confere, nce. H.W.M. Hodges et al., ed. (London, 1992), pp. 175-78. "Conservation News: Sculpture." J. Paul Getty Museum Calendar (Summer 1994), unpaginated. Sullivan, M. "Giving Spain Its Due." Daily News, 23 April 1994, pp. 16-17. Alvarez, M.T. 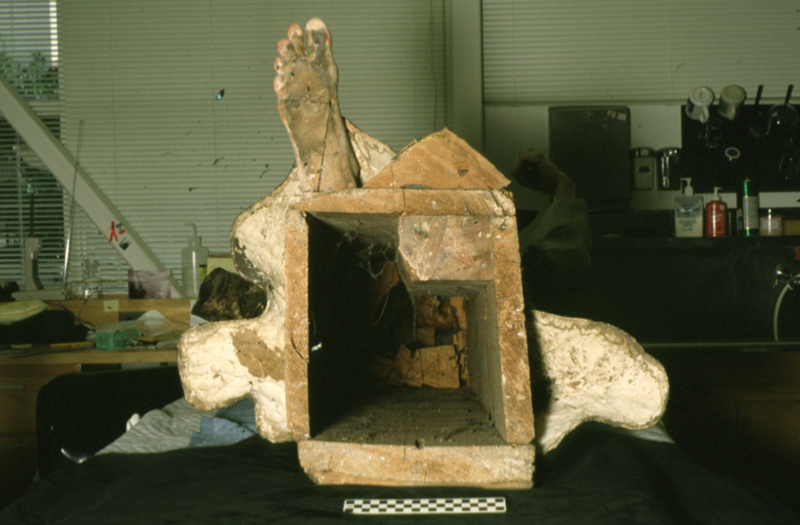 "The Reattribution of a Seventeenth-Century Spanish Polychrome Scuplpture." The J. Paul Getty Museum Journal 24 (1996), pp. 61-68. The J. Paul Getty Museum Handbook of the Collections. 4th ed. (Los Angeles: J. Paul Getty Museum, 1997), p. 261, ill.
Walsh, John, and Deborah Gribbon. The J. Paul Getty Museum and Its Collections: A Museum for the New Century (Los Angeles: J. Paul Getty Museum, 1997), p. 203. Fusco, Peter. Summary Catalogue of European Sculpture in the J. Paul Getty Museum (Los Angeles: J. Paul Getty Museum, 1997), p. 44, ill.
Bassett, Jane, and Peggy Fogelman. Looking at European Sculpture: A Guide to Technical Terms (Los Angeles: J. Paul Getty Museum, 1997), p. 82. Fusco, Peter, Peggy Anne Fogelman, and Marietta Cambareri. 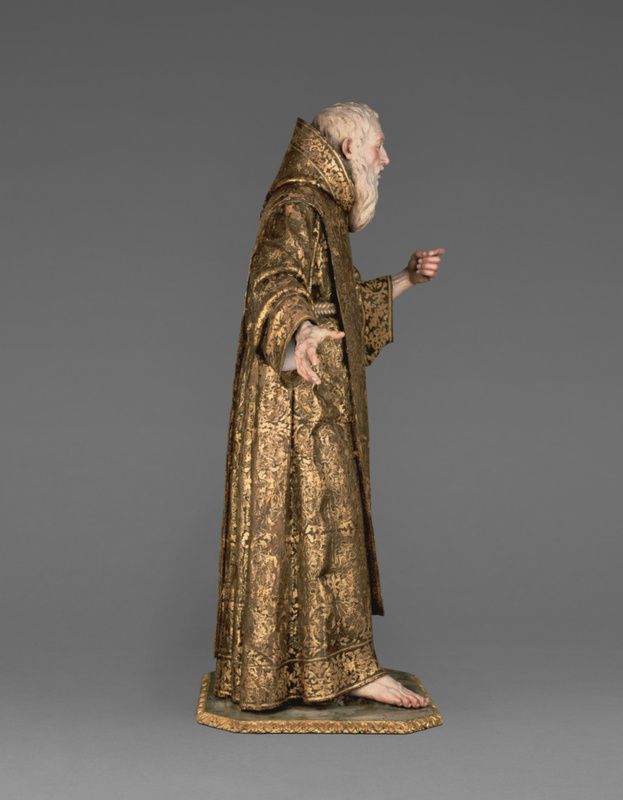 Masterpieces of the J. Paul Getty Museum: European Sculpture (Los Angeles: J. Paul Getty Museum, 1998), pp. 76-77, no. 25, ill., entry by Marietta Cambareri. The J. Paul Getty Museum Handbook of the Collections. 6th ed. (Los Angeles: J. Paul Getty Museum, 2001), p. 261, ill.
Fogelman, Peggy, and Peter Fusco, with Marietta Cambareri. Italian and Spanish Sculpture: Catalogue of the J. Paul Getty Museum (Los Angeles: J. Paul Getty Museum, 2002), pp. 344-51, no. 44. Fogelman, Peggy, and Peter Fusco, with Marietta Cambareri. Italian and Spanish Sculpture: Catalogue of the J. Paul Getty Museum Collection (Los Angeles: J. Paul Getty Museum, 2002), pp. 344-351, ills. 44-44F. "Chip off the old block: Daughter learns to sculpt." Los Angeles Times (April 8, 2003), p. E16, ill. The J. Paul Getty Museum Handbook of the Collections. 7th ed. (Los Angeles: J. Paul Getty Museum, 2007), pp. 214-15, ill.
Doherty, Tiarna, and Anne T. Woollett. Looking at Paintings: A Guide to Technical Terms. Rev. ed. 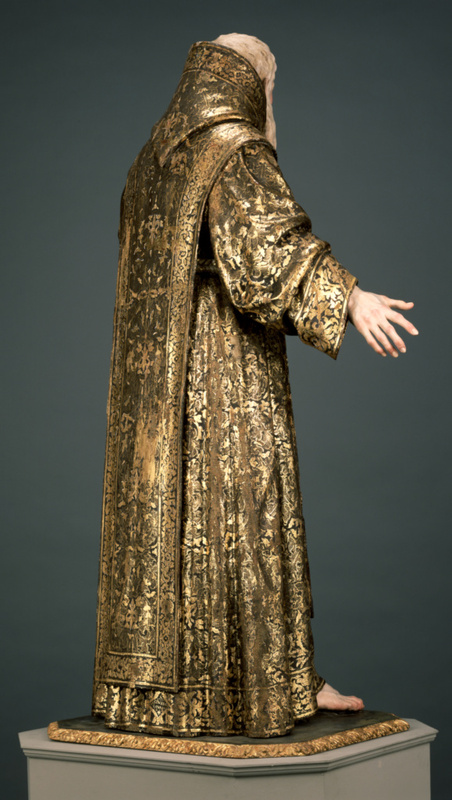 (Los Angeles: J. Paul Getty Museum, 2009), p. 61, ill.
Basset, Jane and Mari-Tere Alvarez. "Process and collaboration in a seventeenth-century polychrome sculpture: Luisa Roldán and Tomás de los Arcos." 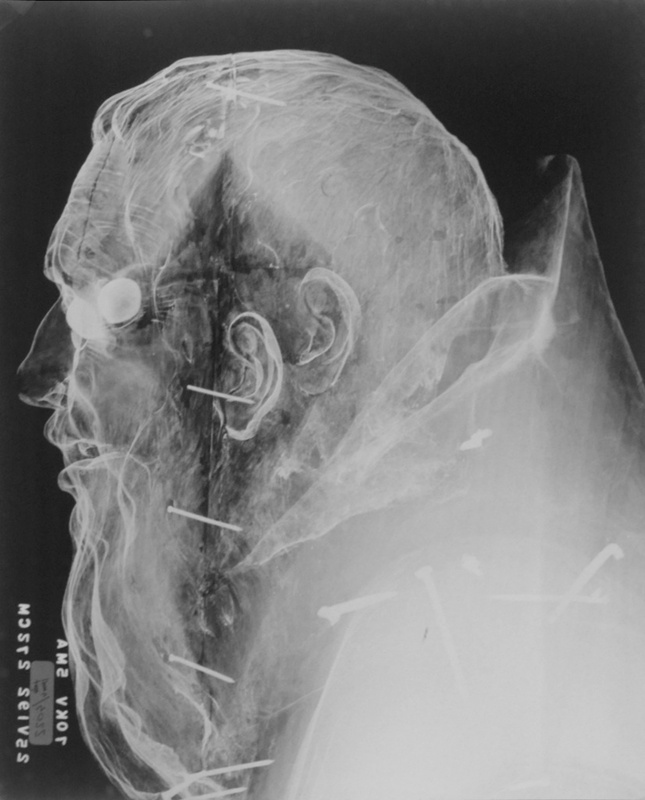 In Getty Research Journal 3 (2011), pp.15-32, figs. 1-2, 4, and 7. Bialonowska, Magdalena. Andrzej Stanislaw Ciechanowiecki. Kolekcjoner, marszand i mecenas (Lublin: Towarzystwo Naukowe KUL, 2012), p. 176, fig. 170. 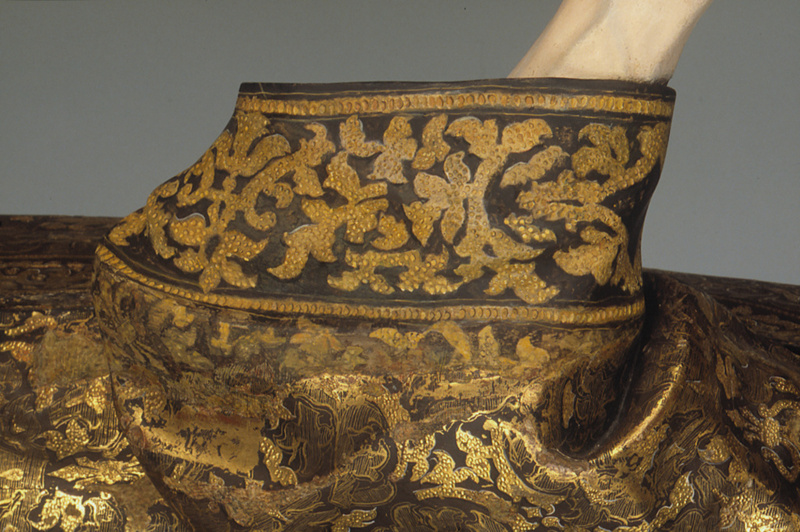 The J. Paul Getty Museum Handbook of the Collections. 8th ed. (Los Angeles: J. Paul Getty Museum, 2015), p. 264, ill. In this lesson plan students learn about two women artists and research a female artist working today.